"Less is More": Week 125 Happy Birthday! Today is very special and so is our challenge this time. It's her birthday and so we'd like to see a CAS card that you think that she would like! It's also Chrissie's husband's birthday today too, but Phil is a few years ahead of Jen! This card has an image from Impression Obsession and lots of glitter! Sorry for the not very good picture! Although I didn't send this one to Jen, I think this is the kind of card that she would like! The stamps are from Paper Smooches. A little 3D Gloss has brightened it up considerably! If you would like to see the card I made for my husband too, head over to my personal blog. It would be great to see you there too. I'm currently in Istanbul but I thought I would still share a card with you. If I had to make myself a birthday it would contain cats, fish or butterflies... 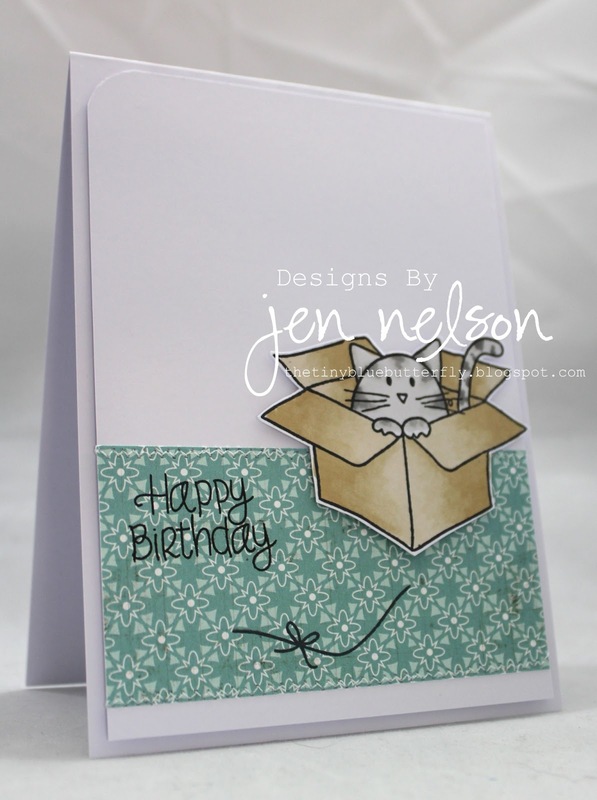 I decided to go for this supercute kitty in a box from Simon Says Stamp! The paper is from LilyBee Designs and it's simply finished off with some stitching. To celebrate my birthday I also have a little Candy on the post with this card on my blog! Do join us for this fun challenge but as ever please remember to leave some white space on your submissions! Happy Birthday everyone!!! Great cards! Thanks for a great challenge, and Happy Birthday to Jen and Phil. It was my birthday last week and I celebrated with a Cappuccino! !........hope you have a cup, or glass, of what you like to drink. Happy Birthday to Jen and Phil! I'm so glad to be able to play along this week! Happy Birthday Jen and Phil....beautiful cards again this week and thank you both for the challenge. What a great idea for the challenge, and again such great examples of cards! Yay, I made it! This was such a fun idea!! Happy Birthday again, Jen!